According to the the Anti-Corruption Society, media outlets are “a well organized system of propaganda and exploitation that has been inflicted on the American population for nearly a century”. ( Media, 2013 p. 1). With a goal of creating distracted, divided and obedient Americans, the media has continually supported actions and policies that are not in our best interest. But, we are smarter than that. 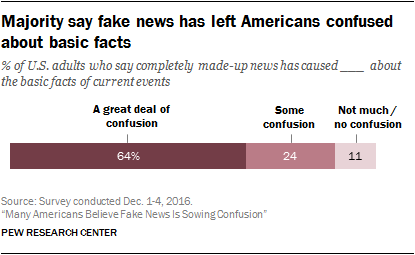 In fact, in its annual confidence poll, ” Gallup found that Americans’ trust in the mass media ‘to report the news fully, accurately and fairly’ reached its lowest level in polling history, with only 32 percent saying they have a great deal or fair amount of trust in the media”(Bernstein, 2017, p.3). Not only do we not trust the media, it has caused much confusion for Americans, as evident from the table above. Reporting inaccurate news has become all too common, and the highlighting of sensationalized stories has dominated newscasts. For example, when watching Good Morning America just a few short days ago, I encountered a gross inaccuracy in the death count in Santa Barbara, California. Sadly, my hometown had experienced a large, devastating mudslide in the fire-ravaged areas of Montecito. Good Morning America reported 17 dead with more than 12 missing persons. With a personal line to the head of the search and rescue team working the front line in Santa Barbara, I confirmed that the deceased only numbered 15, with only 5 unaccounted for. News media outlets fight for viewership and, sadly, exaggerations attract audiences. The journalist serves as the “gatekeeper”, deciding what prefabricated news will be allowed to get through ( Schudson, 1997, p.3). “News is not a report on a factual world; news is ‘a depletable consumer product that must me made fresh daily'”(Tuchman, as cited in Schudson, 1997, p.4). Even Edward Said (1978), intellectual and author of Orientalism, described media outlets as the following: “the omnipresent CNNs and Foxs of this world, plus myriad numbers of evangelical and right- wing radio hosts, plus innumerable tabloids and even middle-brow journalists, all of them re-cycling the same unverifiable fictions and vast generalizations so as to stir up ‘America’ against the foreign devil” ( p.9) . Said recognized that many of the stereotypes regarding the citizens of the Middle East, Africa and Asia were due to unsubstantiated media coverage. Depicted as irrational, violent degenerates by Western scholars, and popular fiction, the inhabitants of the East continue to be targets of biased media coverage. In her TedTalks presentation below, Eefa Shehzad, speaks eloquently about the misrepresentation of Middle Easterners. At only 16 years of age, this Palestinian teen cites statistics and stories exposing mainstream media’s bias. Eefa goes on to share how these indirect injustices affect her family’s safety and security. Our current administration is exacerbating the corruption in the media. Liberal media organizations are telling their versions of stories, and conservative stations are doing the same. Trump himself has even taken to Twitter to combat the situation. In his controversial posts, he is able to reach out directly to Americans without having to rely on the media. Whether that decision is right or wrong, I can’t answer. What I do know is that Trump’s words are “coming from the horse’s mouth”, rather than being distorted by the media. Said, E. (1979). Orientalism (1st Vintage Books ed.). New York: Vintage Books. Schudson, M. (1997). The sociology of news production. Social meanings of news: A text-reader, 722.